Here are just a few of the things going on in and around Prescott AZ this weekend July 28 – 30, 2017! Opening Reception + Artist Talk by artist Diane Silver in her spontaneous and intuitive marks exposing, erasing and bringing back into focus the elements of balance and disorder inhabiting our inner worlds. Gardner Elliot, the first human born on Mars, begins an online friendship with Tulsa, a teen in Colorado. "Clay + Ink + Wax = Fresh New Art"
Please join Mary Lou ( Printmaking and Encaustic ) and Patty Heibel ( Sculpture and Mixed Media Painting ) for a visually incredible exhibit. (Fri)Plaza Suite by Neil Simon, (Sat) Bus Stop by William Inge and (Sun) Same Time, Next Year by Bernard Slate. Join the Prescott Area Iris Society (PAIS) for our huge Annual Iris Rhizome Sale with hundreds of Iris varieties for sale, multitudes of colors and forms. Featuring works from local, regional and national artists and craftspeople, as well as food, drinks and entertainment for the whole family. Classes in recent weeks have been very well attended, you might want to bring a chair or come early to be sure you get a seating. Take a guided nature walk with the Highlands Center Naturalist and enjoy the view. These artists are active members of PCA who love to make their own art and work to encourage all artists, volunteers and gallery visitors who participate in the gallery events. Come see their work shine as it is showcased. Prescott International Folkdancers. We will help you learn dances from several different countries. $3 donation. Performing the Music of Rodgers & Hammerstein and Andrew Lloyd Webber. Prescott, Arizona, in general, is known for its high desert altitude. One of the things that are often overlooked are the cool pines and refreshing lakes. “Everyone’s Hometown,” Prescott AZ is just 96 miles northwest of Phoenix in the Bradshaw Mountains of central Arizona. Summer in Prescott would not be complete without visiting the cool pines of the Prescott National Forest. The forest is located on 1.25 million acres and is divided into eight designated wilderness areas. From camping and fishing to hiking some of the hiking trails are also accessible by horseback. When your ready to escape the city head over to Watson Lake. 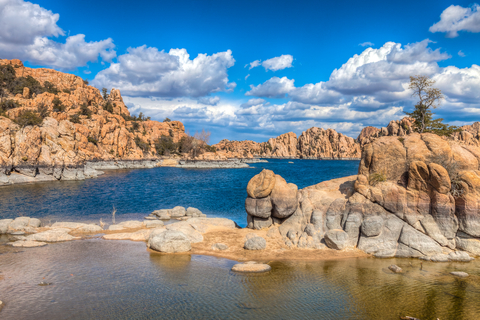 Watson Lake is one of two reservoirs at the Granite Dells that offers many options for outdoor enthusiasts. If horseback riding, biking, hiking or rock-climbing suite your fancy, Watson Lake offers a beautiful sanctuary and as a bonus, it’s an excellent place to bird watch. In fact, did you know that Watson Lake is endorsed by the Audubon Society? Next is Lynx Lake recreation area. 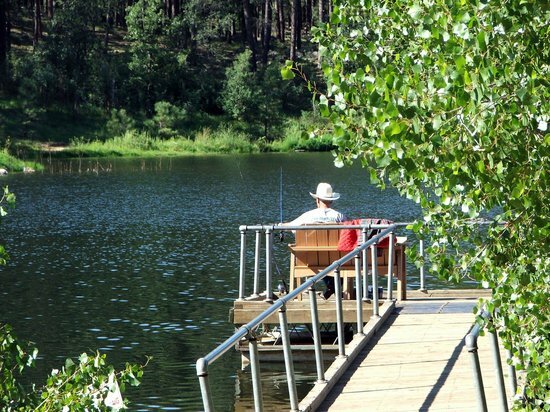 Located just outside of Prescott, Lynx Lake is also a beautiful place to fish, hike, camp, and mountain bike. You can also experience the old west by panning for gold. So you still think Prescott is just a high altitude desert? We also have Goldwater Lake. Goldwater is a reservoir formed by a dam south of Prescott on Bannon Creek. Don’t forget to pack your picnic basket and hiking shoes as the small fifteen-acre lake also offers a variety of outdoor activities. 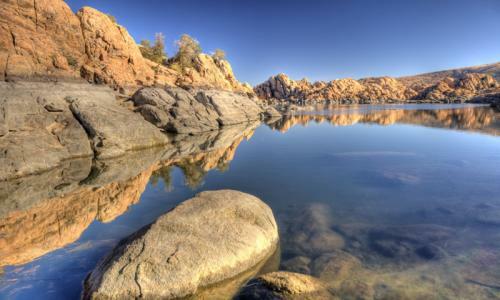 From fishing for largemouth bass and sunfish to horseshoes, volleyball, kayaking, and hiking you’ll forget your in Prescott, Arizona. Prescott Realtor Kathleen Yamauchi Group Real Estate is a dynamic and creative team of highly skilled Real Estate Professionals who are also proud to call Prescott home. If you would like to learn more about what Prescott has to offer during the summer months, contact us today at (928)771-1111. Wally Park and Associates share performances on the steel drum, accompanied by bass and drums, with a special time of discussion about this unique instrument. A sidesplitting send up of greed, love, revolution (and musicals! ), in a time when water is worth its weight in gold. (Fri) Bus Stop by William Inge, (Sat) Same Time, Next Year by Bernard Slate and (Sun) Plaza Suite by Neil Simon. Summer photography exhibit by Prescott area artists. Winner of the 2011 “Tribute Act of the Year”, Corrie is widely considered one of the best, and best known, REBA MCENTIRE tribute artists in the country. Enjoy old west entertainment and costume contests. Event includes vendor booths with goodies and treats for the whole family. Expo with a selection of Readers, Chair Massage, Body Work, Energy Healing, vendors and Aura Photography; a portion of proceeds will be donated to YRMC Family Resource Center. Here are just a few of the things going on in and around Prescott Arizona this weekend, July 14 – 16, 2017! A comedy love story spanning a life time of yearly meetings. Arizona’s Hip Historian, Marshall Shore, will share the magic and history of Route 66 with the audience. This is a free event, and no registration is required. Bring your blankets and lawn chairs, enjoy food and drinks available for purchase from our vendor. Romantic comedy written by Neil Simon, hhilarity abounds in this portrait of three couples successively occupying a suite at the Plaza. During this 4 hour workshop students have the opportunity to create 3 leather roses to take home with them. $45. This year the ride will head out Lake Mary Road with the longer distances looping around Mormon Lake. Enjoy a beautiful 31, 50, 63 or 100 mile, mostly flat ride. Natives, perennials, herbs, houseplants, garden stuff, tools, pots & books. Tool and knife sharpening. Gardening advise. Entertainment. No pets, cash only, rain or shine. Romantic comedy written by Neil Simon, hilarity abounds in this portrait of three couples successively occupying a suite at the Plaza. The festival features 12 short play and monologues that range from comedies to dramas in a mix of entertaining genres. Free outdoor Summer Concert every Friday at the Plaza, performing: Road 1 South. Young people are encouraged to discover foraging for berries, harvesting wheat, rye and oats, making cheese and more 19th-century activities. wide range of Native Indian art exhibited, activities aimed at engaging young people, from creating rock art symbols to acrylic painting, demonstrations and more. The Highland Center will have a display of what the center offers. A raffle of items donated by each artist will have the proceeds given to the Highland Center. Best Fishing Spots near Prescott! Whether you are thinking of selling or you’ve just purchased a home, adding a few touches here, and there can make you the envy of the neighborhood and increase the equity in your home all at the same time. Hardwood flooring – Refinishing or installing hardwood flooring adds both value and beauty to your home. Updated landscaping – From flowing shrubs to flagstone walkways and fresh mulch, updating your landscaping is a sure way to add both curb appeal and equity to your home. Patio or deck addition – Once you’ve updated your landscaping what better way to enjoy the scenic view than to add a patio or deck. Roof replacement – From missing shingles to gritty bits of asphalt raining down from your downspouts to high energy bills, replacing your roof not only protects your investment, the rate of return can be as much as 105%. Insulation – Even though Prescott has a mild 4 season climate, replacing or adding to your insulation is an excellent way to save energy and money on your cooling and heating. Garage door replacement – Replacing your garage door adds instant curb appeal to your home at a relatively low cost. Once your remodeling is complete sit back and enjoy the fruits of your labor. If of course, you decide that ready to sell your Prescott home, please consider contacting us. At Kathleen Yamauchi Group Real Estate we utilize in-house marketing strategies that are second to none. Using the very latest real estate advertising technology and employing the services of a professional real estate photographer, your property listing will stand out from the rest. The bottom line is that at the Kathleen Yamauchi Group, we craft and position the message of your property above all of the other noise in this market. Contact Prescott Realtor Kathleen Yamauchi Group Real Estate to learn more or call (928)771-1111 today.